Gold is the main form of currency in Elder Scrolls Online. It is the most common type of loot, and is also awarded for completing quests, taking part in a campaign in Cyrodiil, and claiming Daily Rewards. Additional gold can be earned by selling items to NPC vendors or trading with other players. Gold is used to pay for most in-game services and is therefore very valuable. Although usually held in a character's inventory, gold can be deposited in a bank in order to transfer it to an alt or contribute towards guild expenses. It can be lost as part of the Justice System. According to a screenshot from 2011, early builds of ESO also used silver and copper currency. As a physical object, gold can be found Coins in many locations. Coins may be marked as unowned or stolen (stolen coins incur a bounty if taken when a witness is present) and often give a low amount of gold. They show the symbol of a chest on one side and a crown with four Daedric letters on the other side. These coins are called "Drakes". 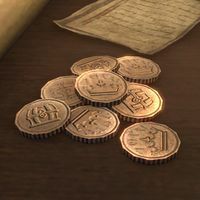 Mistakenly, some coins still use the older model showing the symbol of the Empire on one side and the face of Tiber Septim on the other. 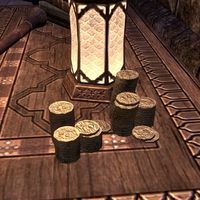 These coins, called "Septims", are used in error as Tiber Septim did not exist as of the time period of ESO and the textures were likely lifted directly from the TES V: Skyrim coin models. This page was last modified on 14 April 2019, at 15:13.